We are pleased to present this information on GILA Window Film, as shown and described by the manufacturer. Because we have not tested this product, we are unable to endorse it or provide you with any additional information. 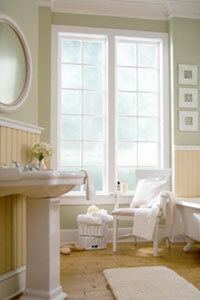 Refresh a home with easy to use GILA Window Film, a creative and inexpensive way to add a personal look. GILA® Window Film is an easy way to treat windows. This do-it-yourself film can add style and interest to almost any area of a home. In addition to adding style, GILA Window Film also can block unwanted views and provide privacy when applied to glass windows, cabinets or doors. Its temporary static cling and adhesive applications allow for a simple, quick change for most clean glass surfaces. When another creative idea comes along, you can cleanly remove GILA Window Film. Windows—to play up existing window panes and unique shapes. French Doors—to make them stand out. Panel Doors—to create interest on a glass panel door by covering only certain portions. Windows or Doors—to add personality to a glass canvas by cutting out and applying fun shapes and designs. GILA Window Film is available at all major home improvement retailers nationwide in a variety of textures and designs.